Lazar Comanescu was born on June 4, 1949 in Horezu, Valcea County. He graduated from the Foreign Trade Faculty of the Academy of Economic Studies (ASE) in Bucharest (1972). Then he followed a course on civilization and contemporary French language in Paris – Sorbonne (1973). In 1982, he obtained a PhD in international economic relations at ASE. After graduation, he entered the Department of International Economic Organizations of the Ministry of Foreign Affairs (1972-1982). After obtaining his doctorate, he lecturered at the Department of International Economic Relations of the Academy of Economic Studies (1982-1990). 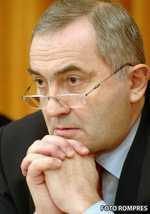 After 1990, he returned to the Foreign Ministry, performing the functions of advisor and in 1993, minister-counselor at the Romanian Mission to the European Union – Brussels (1990-1994), Director of the European Union ( 1994-1995), general manager, advisor to the Minister of Foreign Affairs, director of cabinet (1995). In 1995 he was appointed as Secretary of State for Foreign Affairs (1995 to 1998) in the same period and associate professor at the ASE. Since 1998 came a period of 10 years after Romania’s diplomatic representation to the European Union, Ambassador Extraordinary and Plenipotentiary, Head of Mission of Romania to NATO and the EU (1998-2001), Ambassador Extraordinary and Plenipotentiary, Head of the Mission of Romania to the European Union the (2001-2007), Ambassador Extraordinary and Plenipotentiary and, Permanent Representative of Romania to the European Union (2007-2008). On 14 April 2008, he was appointed by decree as the Minister of Foreign Affairs (April 15th. – December 22 2008). He was ambassador of Romania in Berlin (2009-2014). In February 2015 He was appointed presidential advisor, Head of Foreign Policy. He is a member of the Scientific Advisory Board of the European Institute of Romania, member of the Scientific Council of the Romanian Institute of International Studies and a founding member of the Forum of Central Europe in Warsaw. In 2000, he was Awarded the National Order “Faithful Service” with the rank of Grand Officer. He is the author and coauthor of courses and textbooks including: ‘The World Economy’ (1985, 1990, 1995), ‘International economic transactions Techniques’ (1989), ‘Dictionary of International Economic Relations’ ‘(1993).